Big beautiful succulents are one of the most expensive parts of putting your succulent planters together in the spring - why not learn how to successfully overwinter your own, and have the lush full look you need right away? Learn all about how you can overwinter your gorgeous succulents - bringing them inside for a winter of pampering will give you the chance of keeping them for next season - find out how you can be successful and keep these tender succulent plants alive and happy. Sign up for the FREE Winterizing Succulents E-Course. Learn how to winterize your succulents the right way - this e-course of five automatically emailed articles will show you exactly how to have the best success for your conditions. It outlines several methods for bringing your plants in, with advantages and disadvantages of them all so you can decide which one will suit your conditions. Each article deals with a different aspect of the things you'll need to know to keep your succulent plants happy and healthy, even during the cold and dark winter months. Critical factors are soils, light and water, and most especially how to deal with any uninvited critters that might accidentally be brought in with the plants. Some of the biggest problem pests are scale, mealy bugs and aphids - watch out for them, and learn how to prevent the damage they can cause. Even if you don't have a designated plant room, see how you can easily provide the right situation for sending your plants into dormancy, for a really low maintenance option. If you have bright windows, and you want to enjoy your plants as succulent house plants, I'll tell you how you can achieve that too. The critical factors for each method are discussed in detail, so you can decide. No more wondering if you've done the right thing, and your plants will be ready to go first thing in the spring. This e-course is aimed mainly at those of us who face cold winter weather with frost and snow - not something that many succulents will survive in. But don't hesitate to sign up even if your winter weather is balmy and mild - there is a lot of information about pest control, soils and watering techniques. My Plant Hardiness Zone is great for cold hardy succulents though! Thank you so much for offering this overwintering class on line. I am an avid gardner during the summer but just the past two winters have undertaken trying to overwinter some succulents inside. You are being very helpful and I look forward to each article. NO matter when it arrives. Again, Thank you! Fill out the form below to receive the FREE five part Winterizing Succulents E-Course, and get started; (In a hurry? Need information right now? 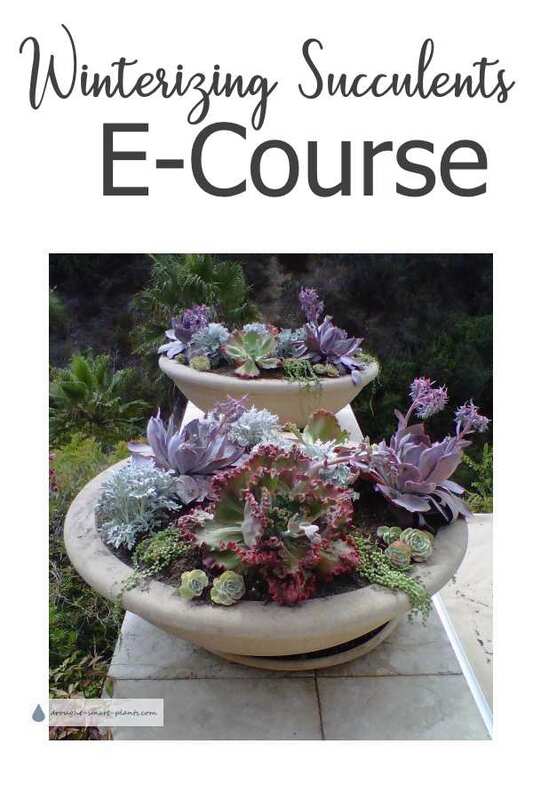 Sign up instead to the Overwintering Tender Succulents E-Course). Join the thousands of others who have accessed this important information, in an easy to digest form - one email will be sent to you every week, and you'll have the opportunity to download the entire e-course as an e-book to keep right at your fingertips. While you're here, don't forget to click the button to add your email and get the Xeria E-Zine every month or so. PS: Please make sure you double check your email address - I have no way to know what the correct one is, if it happens to be wrong. It's so frustrating for me to get the notification that the email didn't go through to you! Also, I get a lot of undelivered mail notices from those with .aol addresses - if you don't receive the email you expect, please try again with a different address. Here's more on how to whitelist emails that you do want to get (ie: those from Drought Smart Plants).